Rory McIlroy continued his love affair with the DP World Tour Championship as he moved into contention for a third victory in the season-ending event in Dubai. 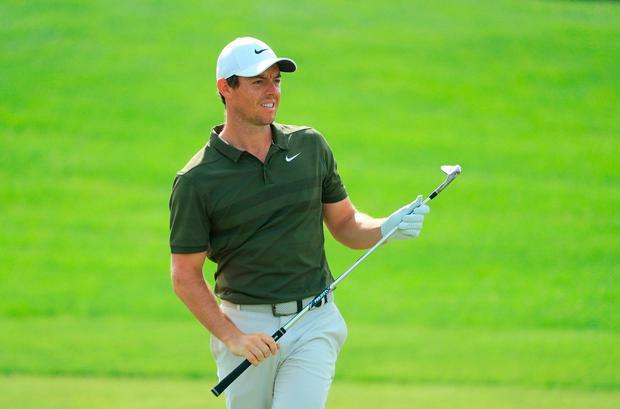 McIlroy began the second round three shots off the lead after an opening 69, but made the ideal start with birdies on the first two holes at Jumeirah Golf Estates, where he has never finished worse than 11th in eight appearances. The former world number one's momentum was halted with a three-putt bogey from long range on the third, but the 29-year-old almost holed his tee shot on the par-three sixth and tapped in for his third birdie of the day. At five under par McIlroy was one shot behind overnight leaders Jordan Smith and Adrian Otaegui, who had been joined at the top of the leaderboard by Wade Ormsby and Dean Burmester. McIlroy was unable to birdie the par-five seventh after missing the green with his approach and also failed to convert from 12 feet on the next. However, the Northern Irishman did birdie the ninth after a superb second shot to four feet to improve to six under, one shot behind clubhouse leader Alexander Bjork. Bjork holed from 40 feet for an eagle on the 18th to complete a second round of 65, although with six players - including McIlroy and playing partner Patrick Reed - only a shot behind, it was unlikely that Bjork would hold on to his slender advantage. McIlroy and Reed both birdied the 10th from close range and Reed picked up another shot on the 11th to join England's Matt Wallace in the lead on eight under par. Further chances went begging for McIlroy on the 11th and 12th and he then failed to get down from just off the 13th green to card his second bogey of the day. The top 17 players were separated by just three shots on a packed leaderboard, with Tommy Fleetwood just one off the lead as he chases the win required to have a chance of overhauling Ryder Cup partner Francesco Molinari and retaining his Race to Dubai title. After missing some straightforward chances, McIlroy holed a far more difficult, curling birdie putt on the 14th and picked up another shot on the 16th. But he was unable to birdie the par-five 18th after his approach clattered into the grandstand and rebounded into a greenside bunker, from where he was unable to get up and down. Playing partner Reed missed a short eagle putt but tapped in for birdie to complete a 66 and set the clubhouse target on nine under, with McIlroy a shot behind following his 67. Brian Keogh Shane Lowry was "chuffed" to rediscover his driving mojo and race into the overnight lead with a bogey-free 65 at the RBC Heritage in Hilton Head.